ab25254 recognises Integrin ß4 chain (CD104), Mr 200 kDa. Full length native protein (purified) (Mouse) - Tumour associated antigen TSP 180 - immunoaffinity purified from a transplantable BALB/c mouse lung cell carcinoma. Our Abpromise guarantee covers the use of ab25254 in the following tested applications. IHC-Fr Use a concentration of 1 - 5 µg/ml. WB Use at an assay dependent concentration. Predicted molecular weight: 202 kDa. 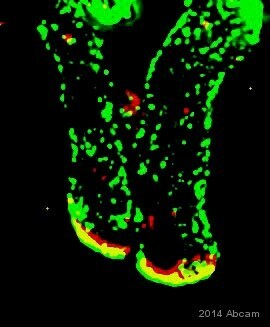 This image shows a acetone fixed frozen section of BALB/c mouse intestine. The basal layer stains intensely (arrow). ab25254 staining mouse small intestine tissue sections by IHC-Fr. Sections were PFA fixed and blocked in 3% BSA for 1 hour at 37°C prior to incubatition with the primary antibody, diluted 1/500, for 12 hours at 4°C. 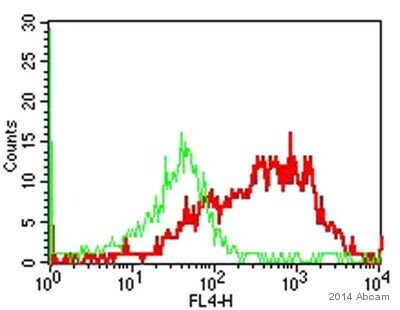 A Cy3® conjugated goat anti-rat antibody, diluted 1/200, was used as the secondary. ab25254 staining Intergrin beta 4 in mouse colon cells by Flow Cytometry. The sample was incubated with the primary antibody (1/100) for 30 minutes at 20°C. 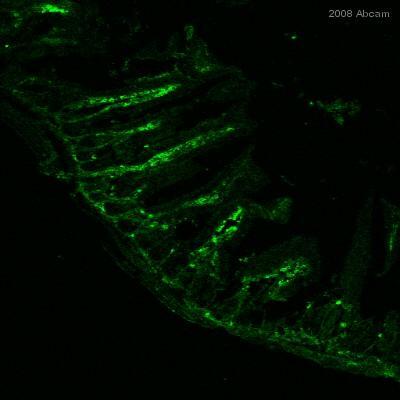 An undiluted Alexa Fluor® 647-conjugated goat anti-rat IgG polyclonal was used as the secondary antibody. Gating Strategy: Exclude small cells/debris. Publishing research using ab25254? Please let us know so that we can cite the reference in this datasheet. Please send two testing discount codes for two integrin beta 4 antibodies for flow cytometry of mouse samples. I am very pleased to hear you would like to accept our offer and test ab25254 in flow cytometry, and ab110167 on mouse samples. To redeem this offer, please submit Abreviews for flow cytometry on mouse samples and include the appropriate code in the “Additional Comments” section so we know the Abreviews are for this promotion. Please remember that submission of the Abreview is sufficient for the discount code to become active.